If you remember I was recently asked to bring a couple of savory breads for a family gathering we were attending. I like to bake these things myself instead of buying them for both financial as well as environmental reasons, but c’mon I like my convenience factors too! I decided I’d like to try both Pesto and Rosemary/Cheddar. The Pesto was made with the last of my homemade basil pesto from the freezer as well as chunks of my homemade dehydrated Italian-seasoned tomato leather from last year’s tomato harvest. That pesto bread turned out great, both soft & flavorful. I shared the recipe and instructions for my Italian Pesto/Dried Tomato bread last week, but what about the Rosemary/Cheddar version? Oh man, you’re *SO* gonna want to read this! At first as I was bumbling around in the kitchen I was certain I’d bitten off more than I could chew, trying to bake up a double-batch of homemade brownies while also trying to fit in two savory bread recipes that I’d never made before. But although for a short time my kitchen was a confirmed disaster area, it all turned out great and I was able to bring some delicious homemade contributions to the meal at our family gathering. Both the Italian Pesto as well as the Rosemary/Cheddar needed to go into the oven at the same time so I needed to prepare & measure out as much as I could for each recipe before actually mixing up the ingredients so there wouldn’t be much lag time between placing the batter in the pans and actually putting both pans in the oven. Since I already talked about the Pesto version last week, today I’ll share the procedure for the Rosemary version. Before I got started mixing up the recipe I pulled my basic quick beer bread recipe & read over it. I already knew in advance that I was attempting a pesto version but I also decided to try a loaf of Rosemary/Cheddar Bread. I mean, I have these big beautiful rosemary plants right outside my back door bursting with fragrant goodness so why not use them #amiright?? So I went outside & pulled a few stems of rosemary, minced them up finely and set it aside. I mixed the dry ingredients & measured out the other ingredients so I could mix everything together quickly & get both varieties of bread into the oven at the same time. 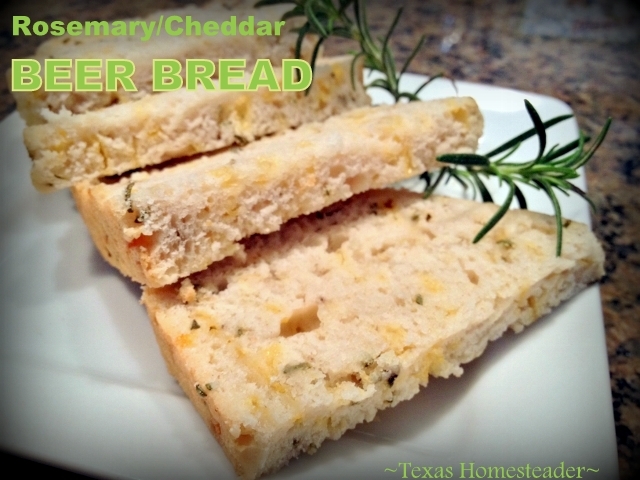 For my rosemary bread I wanted to use a sharp cheddar cheese along with my minced rosemary. I thought the sharpness of the cheese would offer a flavor punch to the bread without having to use too much. So to the standard beer bread dry ingredients that I’d pre-measured I added a 12-oz bottle of beer. Then I stirred in about 3 Tablespoons of minced fresh rosemary and 1/2 cup shredded sharp cheddar cheese. I used a pastry brush to oil the 9×5 glass loaf pan with olive oil. Now it’s time to pour in the batter. When the batter had been smoothed into the pan I brushed the top of the dough with a little more olive oil & added a light sprinkle of minced fresh rosemary & also a sprinkling of coarse salt. I preheated the oven to 350 degrees, then placed the loaf pan into the oven and baked the bread for 45 minutes. After that time I pulled the pan from the oven and poured about 4 Tablespoons of olive oil over the top surface of the bread and returned it to the oven for the final 10 minutes baking time. When the bread was finished baking I removed the pan from the oven. The bread was placed on a baker’s rack for a few minutes to begin cooling. I slid a butter knife between the bread & the pan to loosen the bread to make it easier to remove. I placed the still-hot bread on a baker’s rack & covered it with a clean towel to allow it to cool completely. So how did it taste? Aaaah-mazing! 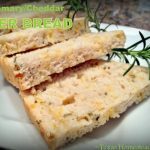 Although we all loved the pesto bread and it was certainly more powerfully flavored, RancherMan & I loved the more subtle flavor of this Rosemary/Cheddar version the best. The bread was dense but soft. And the sharp cheddar married beautifully with the minced fresh rosemary. Oh, and it was a completely different taste explosion when you cut it into slices and toast it. Oh. My. Goodness!! I’m certainly counting this recipe as a screaming success! It will be an easy go-to recipe when asked to bring something for a covered dish or gathering. Preheat oven to 350 degrees for glass pan. Mix dry ingredients together, then slowly add beer & stir to combine. Add the desired stir-in options for Rosemary/Cheddar bread & blend thoroughly. Transfer batter into well-oiled 9x5 glass loaf pan, brush surface of batter with olive oil & sprinkle additional minced rosemary and coarse salt if desired. Bake on the middle rack of the oven for 45 minutes. Remove pan from oven and pour 4 tablespoons of olive oil over the surface of the loaf & return it to the oven for the final 10 minutes baking time. When baking is complete, remove the pan from the oven. Carefully remove bread from pan and place bread on baker's rack. Cover hot bread with a clean towel & allow to cool completely. This entry was posted in Blog Posts and tagged Cooking, Frugality, Make-It-Yourself, Recipes on April 12, 2015 by Texas Homesteader. A delicious combination. Thanks for sharing on the #WasteLessWednesday Blog Hop! 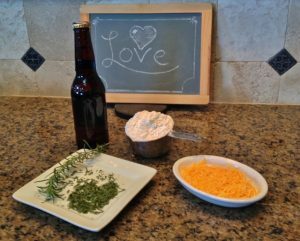 Ok so let me get this straight – cheddar, beer, rosemary – I mean how bad could this really be?!?!?!?! Pinning this because it sounds AMAZING! Thanks for sharing at #HappinessIsHomemade this week! Looks delicious, and I’ve always wanted to try making beer bread. Pinning for later! Thanks for sharing your posts on the Homestead Blog Hop! Your recipe looks wonderful! I made beer bread for the first time in January and was delighted with how easy it is to make as well as how light, even though I made it with 100 percent stone ground whole wheat flour. Marvelous! I look forward to trying your cheddar rosemary version next time I purchase a bundle of fresh rosemary. No rosemary plants outside my city door, I’m afraid. Sounds good. I want to try. Does my blog show up when I comment? Just wondering. I don’t get this whole google thing. I am at http://www.myjourneyback-thejourneyback.blogspot.com Come over for a visit! We’re neighbors! My husband will love this!! Thanks for sharing on My 2 Favorite Things on Thursday – Link Party!! Hope to see you again on Thursday!! Pinned! It sounds so yummy! Thank you for linking up at Idea Box! Great recipe! I just pinned it so I can make it! 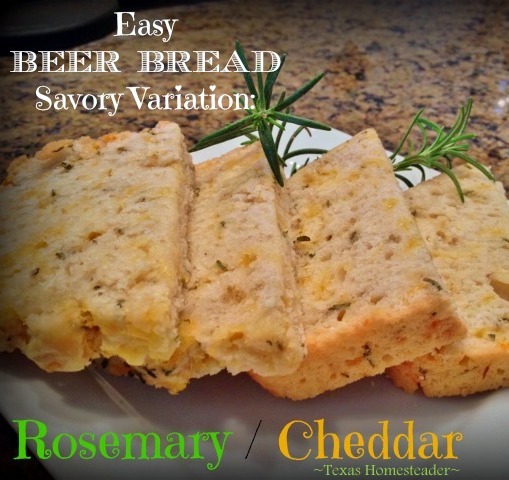 Love beer bread AND rosemary! Yum! Stopping by from the Homeacre Hop! Your bread looks delicious. You posting this recipe reminds me of the type of different breads that I used to make years ago, including my Cheddar – Olive Bread I have only made Beer Bread once in my lifetime and as I recall we really didn’t care for it that much at the time, but like your idea of adding the cheese and rosemary to the dough. Thanks for sharing your recipe and bringing back a few memories. :} Use the small pimiento-stuffed olives; well drained and wiped dry with paper towel if you decide to use olives in your bread. When making your biscuits I had made a honey glaze to brush on top just as they came out of the oven……..Oh, how yummy they where. Honey Glaze 1/2 cup honey 1/4 cup butter Place in small sauce pan and heat till butter melts. Brush on bread or biscuits as soon as they are removed from the oven. Question, why the olive oil on top and then return to oven? Could you use dry Rosemary for close to the same results?